Rupees 500 and 1000 Currency Abolished From Tonight, What To Do Now? While addressing the nation today, PM Narendra Modi announced a huge demonetization scheme, which says Rs 500 and Rs 1000 notes will not be considered as legal from today midnight (9 November). This huge act is one of the most daring and major step against black money, terrorism and forged currency. Without talking much let’s take a look at the some important highlights related to the announcement. Old Rs 500 and Rs 1,000 currency notes discontinued from midnight of November 8. From November 10-24, old notes worth Rs 4,000 can be exchanged per day. Post November 24, this limit will be increased. The exchange can be done at any bank branch or post office upon showing your ID proof such as the Aadhaar card, Passport, Voter card, Ration card etc. The old notes of Rs 500 and Rs 1,000 can be deposited in the Bank branches and Head post offices of the city or state. This can be done till December 30 this year. 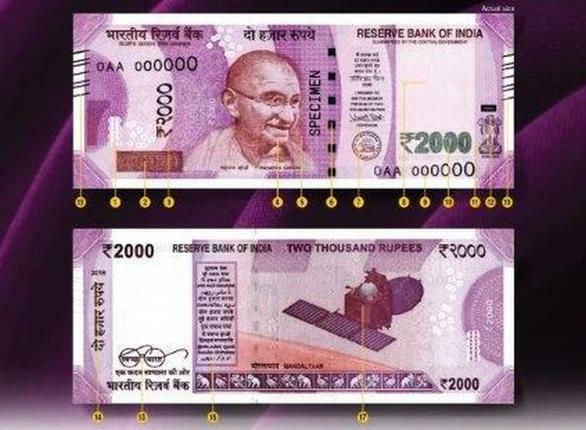 New denomination notes of Rs 2,000 and Rs 500 will be circulated soon. 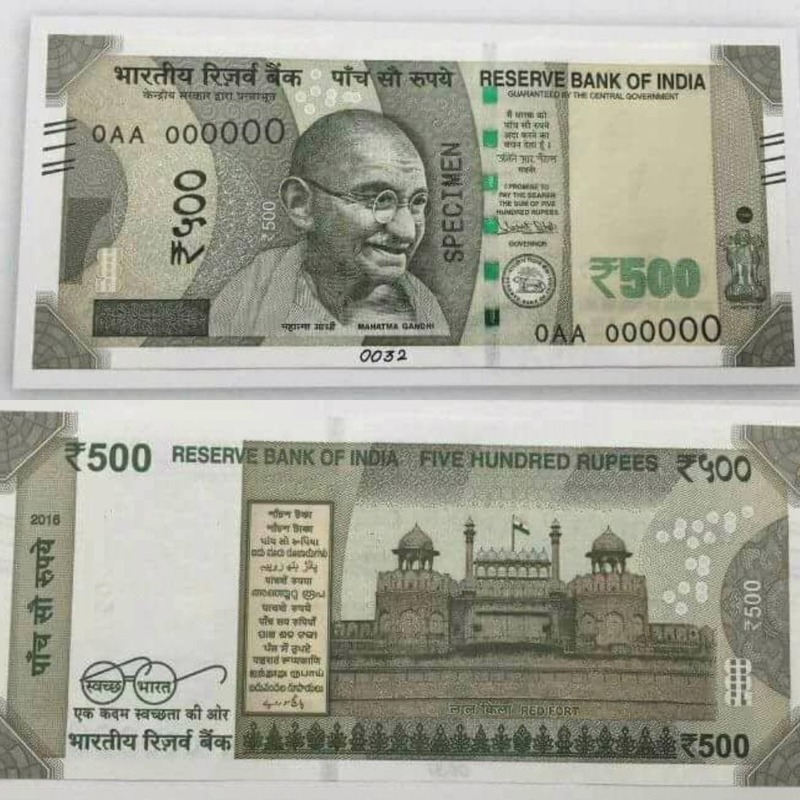 ANI has put out pictures of the new Rs 500 and Rs 1,000 notes that will be issued. Although the notes cease to be legal tender from the midnight of November 8, some flexibility has been provided to those who might need cash urgently. Such flexibility been provided with a 72-hour window, i.e from November 9, till November 11, midnight. 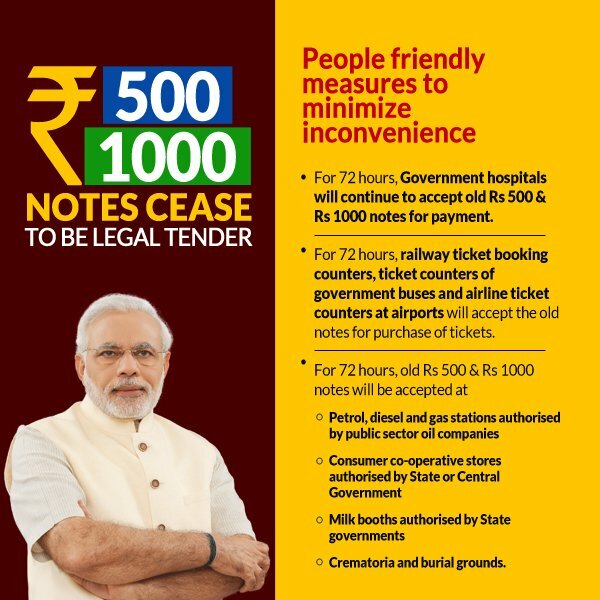 During this window, old notes of 500 and 1,000 will be acceptable in government hospitals, and their dispensaries, at public sector petrol pumps, cooperative shops and dairies approved by the state government.The old notes will also be accepted at Railway booking counters, Government bus stands and airport ticket booking counters Government bus stands and airport ticket booking counters. Those moving to and from the country will be allowed to exchange their old notes/foreign currency in this 72-hour window. ATM withdrawals will be restricted to Rs 2,000 per day initially, after which the limit will be increased to Rs 4,000 per day. People who possess Rs.500 or Rs. 1000 currency notes after December 30 can exchange it at Reserve Bank of India by providing a declaration. This is till March 31, 2017. IMPORTANT: Please cooperate and do not panic. All these measures are taken for the wellness of the country and its citizens. This step will act as a milestone in better future of India. It will impact positively on country’s economy on a longer run.